That rare creature -- a clip show of heavy drama and quirky comedy. Ebenezer Wright (Tim Thomerson) wants to get the "feel"
of St. Eligius. Dr. Craig (William Daniels) is dubious. I had completely forgotten about this episode from my original viewing: season 5, episode 21, "Good Vibrations". 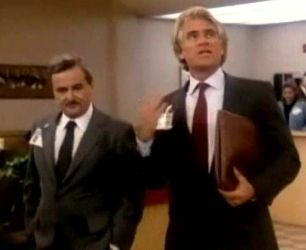 A Japanese-owned HMO is buying St. Eligius, and the representative they send, Ebenezer Wright (Tim Thomerson), is a flaky hippie-turned-corporate stooge, one who insists on eschewing the reports and statistics and instead experiencing the emotional aura that has built up in the hospital's fifty years of death, birth, love, heartache, grief, and wackiness. His musings thus set up the introduction of clips from old episodes, recalling classic moments. I watched this one last night, and after having recently caught two or three Friends clip show episodes, which recount the funniest scenes and most heartwarming moments around various themes, it was really odd to see a show introduce a clip of scenes that were downright bummers. Sure, they were powerful and good, classic moments, but being used to clips interjected for laughs, it's weird to see them interjected for tears. Mark and Ellen Craig identify their son's body after his fatal car accident. Donald has to inform Jack that his wife has just died after falling in the bathtub and hitting her head. 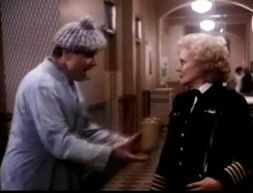 Homeless woman Cora (Doris Roberts) tells her mentally challenged homeless companion Arnie (James Coco) that she'll have to have her feet amputated and be put into care, and he'll be left alone. Arnie has a nervous breakdown in the hallway. The Womb, another Alex Corey original. These are mixed with moments of mirth and whimsy. 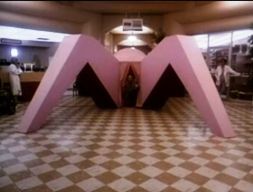 Artist Alex Corey constructs a vaginally-inspired sculpture in the lobby. Drs. Ehrlich and Caldwell ponder their relationships to Roberta and Joan, neither realizing the other is referring to their own partner, and simultaneously reaching conclusions to divorce (Ehrlich) and to propose (Caldwell). And there's a highlight reel of Mrs. Hufnagel's greatest lines, concluding with her death, folded up in a malfunctioning hospital bed. I thought I'd have more to say about it. but I guess I don't. Just odd to see a dramatic series do the clip show formula with dissolves (pixelated, in this case) to classic moments, many of which were very, very sad. Wikipedia's page gives a pretty good outline of the various kinds of clip shows. To be honest, I went to bed before finishing the episode, so when I watch the rest of it, I'll update this post if there's anything else to say. Added, July 5, 2012... Okay, actually watched the rest of this one on the weekend. I watched the whole thing this time, and it fits in pretty well with the ongoing stories towards the end of season five, and I enjoyed the selection of greatest hits. I remembered how when I saw that episode for the first time, I had never seen any of the episodes from which the clips were drawn; however, I was familiar with a lot of the events from characters discussing them. it's Captain Gloria Neal (Betty White). Jerry Singleton (Alan Arkin) drives his car into the E.R. A punctured giant Snoopy balloon from a parade is brought into the E.R. Mark headbutts Victor in the O.R. ; Victor faints in the O.R. ; Victor examines himself while assisting Dr. Barton in the O.R.